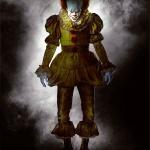 If you are like me, you want to see every/any news related to Andres Muschietti‘s It (2017) so here is the complete Pennywise gallery of images released thus far. 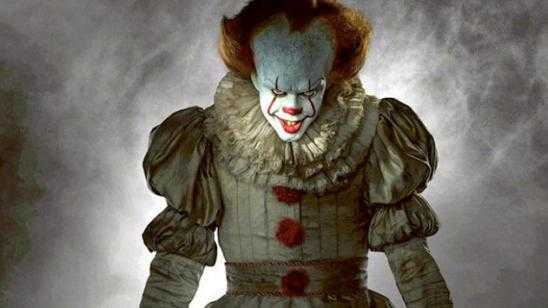 Bill Skarsgard may pull off the role and will have no choice but to make the Pennywise character his own else fall short of Tim Curry‘s performance as a copy. Skarsgard delivered some genuinely creepy moments in Netflix’s Hemlock Grove. 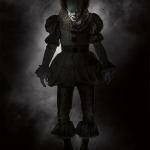 IT will release in movie theaters on September 8, 2017, and teased with an R rating. Gary Dauberman penned the script with Jaeden Lieberher, Finn Wolfhard, Nicholas Hamilton, Jack Dylan Grazer, Wyatt Oleff, Chosen Jacobs, Jeremy Ray Taylor, Javier Botet, and Owen Teague set to co-star. The costume definitely incorporates all these otherworldly past lives, if you will. 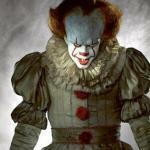 [Pennywise] is definitely a clown from a different time. That pleating is actually Fortuny pleating, which gives it almost a crepe-like effect. It’s a different technique than what the Elizabethans would do. It’s more organic, it’s more sheer. It has a whimsical, floppy quality to it. It’s not a direct translation of a ruff or a whisk, which were two of the collars popular during the Elizabethan period. There is almost a doll-like quality to the costume. The pants being short, the high waistline of the jacket, and the fit of the costume is a very important element. It gives the character a child-like quality. If you look at the sleeves, there are the two puffs off the shoulder and biceps and again on the bloomers, I wanted it to have an organic, gourd or pumpkin kind of effect. It helps exaggerate certain parts of the body. The costume is very nipped in the waist and with the peplum and bloomers it has an expansive silhouette. The pompoms are orange, and then with the trim around the cuffs and the ankles, it’s basically a ball fringe that’s a combination of orange, red, and cinnamon. 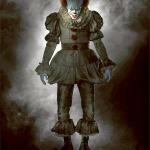 It’s almost like Pennywise fades into his environment. But there are accents to pull out the definition of the gray silk. It makes him almost like a shadow.